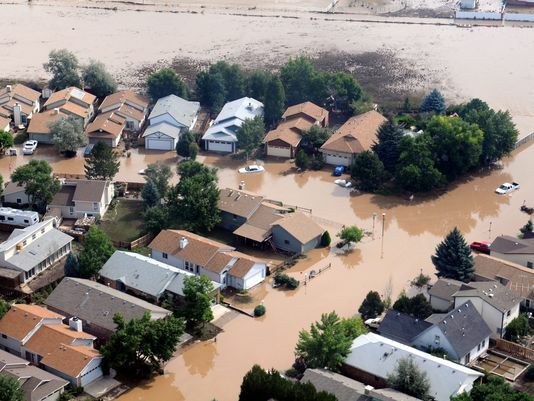 Exactly one year ago, Boulder and its surrounding counties were in the middle of several solid days of rain that quickly became a thousand-year storm and a hundred-year flood. We were all affected in a myriad of ways by the destruction, sadness, and anxiety that resulted, whether our homes were impacted or not. Sometimes, on a crisp blue-sky day with the Flatirons sparkling in the sun, it seems surreal amid such beauty that such devastation could actually have taken place. Like for so many, the night of the flood was a scary experience for me. I had been evacuated before for fire and had been woken up in the middle of the night by earthquakes, but this was a different kind of fear. My house and my office, two separate buildings on my property, are both in the flood plain. By the time the flood started, it had been raining non-stop for three days. I had been on a relocation all day and got home at 9:30 that night. When I walked across my lawn I actually sank into the grass so deeply that the water filled my shoes. My neighbor told me to check my backyard, since hers was filling up. I watched in disbelief as my street became a river and water started pouring towards the house. My stand-alone office is an outbuilding in my backyard. When I saw that the far end of the yard where my office and shed are was beginning to slowly fill with water, I raced out there to put everything up on the desks, unplug the electronics, and save what could be saved as it became clear that flooding was inevitable (if only I had remembered the files in the bottom drawers!) At the time, riveted by fear, I didn’t realize how lucky I was that my house had been spared. I measured 19 inches of water in my office--much less than many people had, but plenty for me. I had so much adrenaline and fear coursing through me that sleep was elusive for several nights. 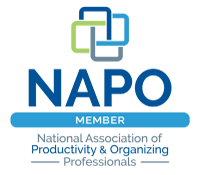 I am in the business of helping people organize and streamline their lives. What better time was there to offer my services? My team and I donated our time to several clients whose homes were destroyed; shoulder to shoulder we dug through kitchens, laundry rooms, living rooms, and basements of mud and soaking wet cardboard to try to salvage anything possible. One client had three feet of mud in her living room; another one had unwittingly opened her front door and ushered the flood in. I encouraged people to donate household items as freely as they felt they could. So many families were--and still are--in need of replacing everything. The camaraderie of our community during that time was incredible. So much caring, so many offers of help; neighbors checking in, friends who didn’t flood on Wednesday coming and helping on Thursday, to whom I returned the favor when they ended up flooding the next night. I had my own clean-up project going at the same time I was helping my clients. It took six of us a full week to clean up the mud and filth in my 200-square-foot office, and then I had to replace the floor, some walls, carpet, and paint. (During that time my dining-room table functioned as Org & Relo’s makeshift HQ.) When the sun eventually came out and the waters receded I was amazed to see that all my new landscaping had vanished and that every single item in the yard had relocated itself elsewhere; chairs, tables, sawhorses. And here’s the real irony: I spent $5000 to get my office up and running again (neither flood insurance nor FEMA cover outbuildings) and then an unusually heavy day of rain on June 6th flooded it again. It wasn’t as bad this time, but reliving the stress was intense. Fortunately, I had learned a few lessons from the last time. I guess that old adage is true: when it rains, it pours. I know things have settled down a bit since the flood a year ago--roads are repaired, schools are in session, debris has been carted away--but many people are still suffering tremendously. As of this week, 68 homeowners in Boulder County are waiting to hear if FEMA is going to buy out their destroyed properties so they can move forward with their lives. Shockingly, many dislocated people are still paying mortgages on uninhabitable properties AND paying rent where they now live. Anniversaries always seem to make us reflect--speaking of which, it’s September 11th, already an emotional day in our country--and as I think back on lessons learned since the flood I thought maybe I could offer some insights. Nobody wants to think this could happen again, but if it did, my question is: How can we be even smarter in the way we set up our homes? I usually sign off with “happy organizing!” but it somehow doesn’t feel quite right after a post like this. I think I’d rather say thanks for reading, and to my Boulder readers in particular: may today find you in better circumstances than you were a year ago.